But over the last few days, we have been seeing 3 line and even 4 line descriptions in SERPs. Of course I searched around to see if anyone was already talking about it. There’s very little out there yet. Mary Soule, with Hall Internet Marketing posted her SEO research on what might trigger this. Her study looked for correlations with keyword density or link authority. But she found no connection. With Google’s latest algorithm focusing on mobile and user intent, and now publicly announcing an algorithm based mobile SEO penalty, my thought is to look at user intent or search intent. Part of Google’s latest push has been to answer questions in the SERP so you don’t have to click through and leave the site. Scenario: I know, I sometimes try to find answers to my questions by skimming the descriptions — I’m too lazy to click through or don’t want to wait for a page to load and read through it to find the answer. If I do click through and don’t find the answer, I’ll hit the back button and take a second look at the description. This time I look for context that will help me find where on the page my answer is. 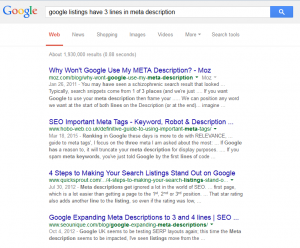 Mary Soule’s post noted that the longer descriptions pull the first part from the META description and the second part from the content of the page. It’s easy to see how content from the page surrounding your search term can either answer your question or at least help you find the context of your answer. My preliminary research suggests that long tail queries are more likely to trigger SERPS that include long descriptions. These tend to include forum results, long detailed blog posts or articles. However, I don’t see a simple relationship between the length of a post and it’s likelihood to show a long description compared to other results in the SERP. 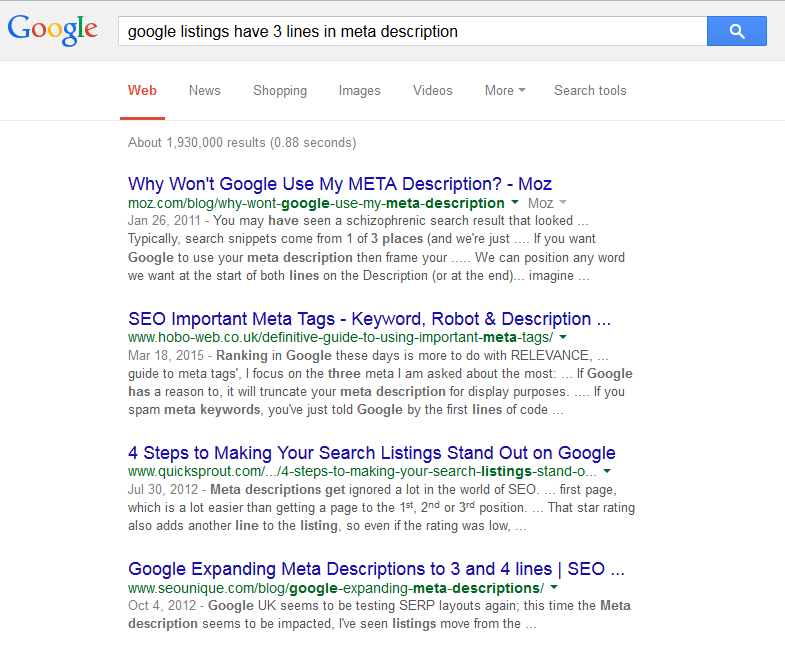 For example, a search for the 3 word phrase “descriptions in SERPs” triggered all traditional 2-line descriptions. This 4 word query “descriptions in Google SERPs”, though “in” may be considered a stop-word, triggered all 2-line descriptions. And some were the same results (however a 2 line version) that appeared as 4-line descriptions for this longer query “very line long descriptions in google SERP”. Another theory is that there is a connection with content that appears in Google Answers and it’s likelihood to display more description lines when it appears in regular web listings. However, this may not be a cause and effect, but in my opinion more likely a coincidence due to an overlap in criteria for content to appear in either spot. Both theories combined paint a picture about Google’s intention to better answer the needs of the searchers and fulfill their intent. A 4 word query may be more complicated and detail oriented. Therefor, Google provides a detail oriented answer directly in the SERP. 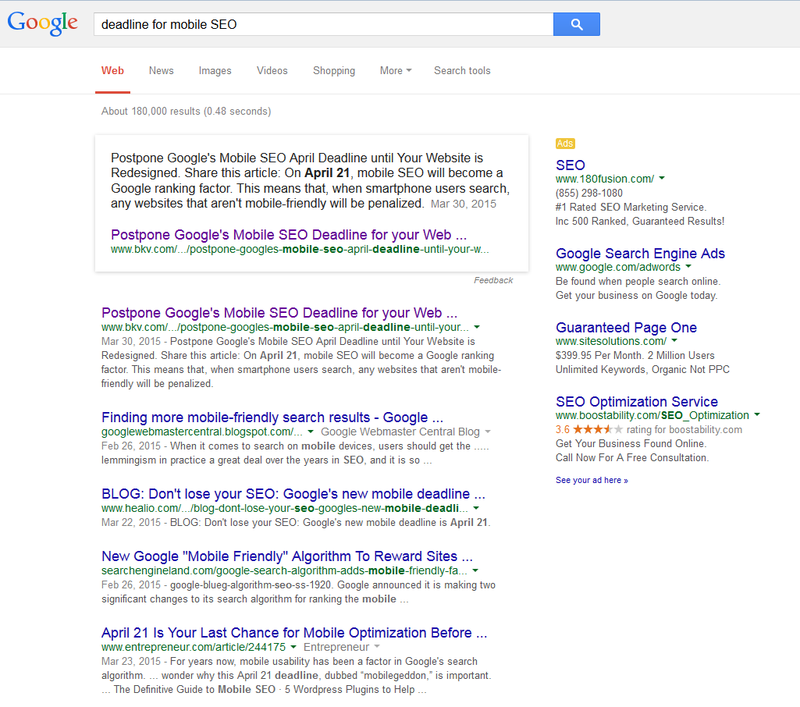 If search intent is informational research, than Google can possibly provide an answer right in the SERP. If the intent is transactional, Google will need to send you off to a shopping area that best suites you. However, if you are researching products, like “which sports cars have 4 seats”, Google gives a handful of 3 or 4 line descriptions. If you shorten it down to a more transactional search where you are describing a product, “sports cars with 4 seats”, you see all 2-line descriptions. So it seems there is a mixture of results depending on how much the query skews toward research. With this line of reasoning, there is no point for Google to give long descriptions for a transactional query. It makes more sense to just send the user off to buy the product. It may be worth while to experiment with longer descriptions. Since Google claims they do not affect rankings, and they more often appear jumbled & rearranged, why not? The place to do it that makes the most sense are the FAQs, detail pages, articles, blogs or anything that tends to give long answers for questions. Historically this type of content lands a large volume of organic traffic across a wide range of long tail searches. Let me know in the comments or tweet me about your results for long descriptions in SERPs.